Several months ago, in Damned Data, I was musing about the huge gulf that exists between academics and ordinary people when it comes to the mysterious “Head” that was supposed to have been worshipped by the Knights Templar. The academics spit blood and say the Head never existed, while ordinary people wonder how they can be so sure. I mentioned the inconvenient fact that a panel painting of a Head is on display in the church at Templecombe in Somerset, which was formerly a preceptory of the Templars. 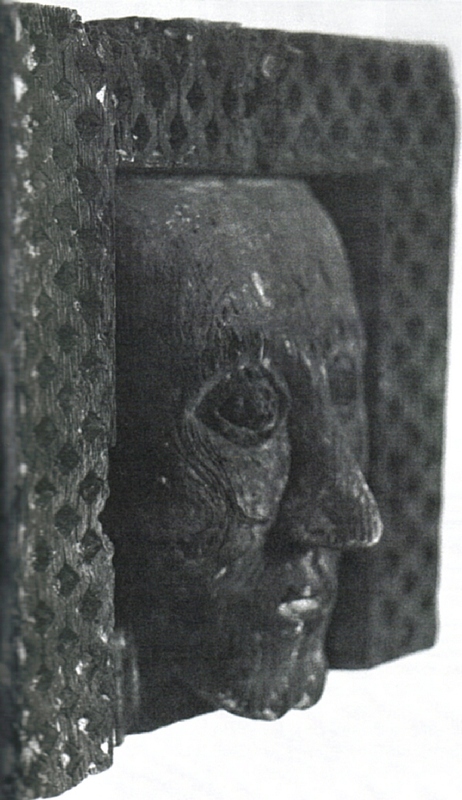 And according to Juliet Faith, in a book I’ve just read called The Knights Templar in Somerset , there is another mysterious Head, in another church with Templar connections in another part of Somerset. 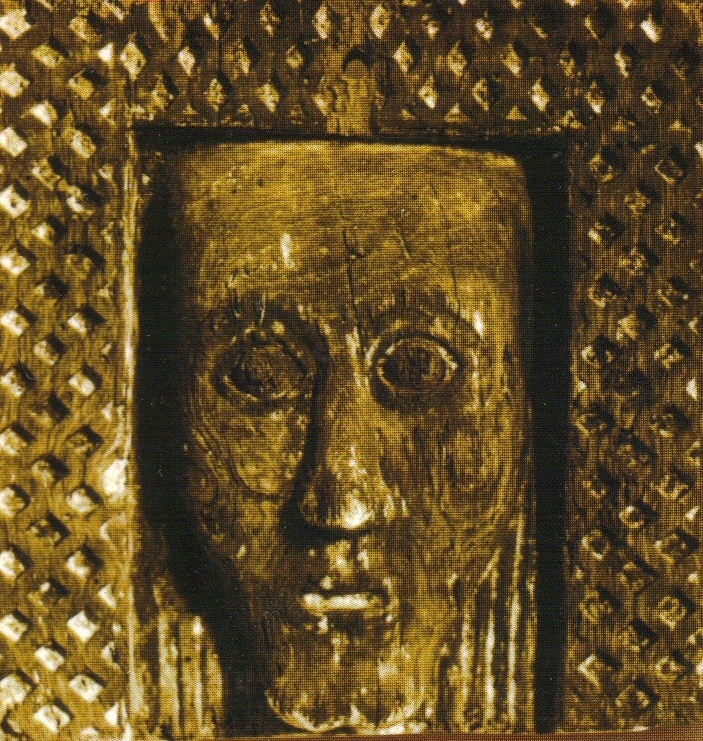 The second Head (pictured left) is a life-sized wooden carving found in 1959 in the church at Cameley, south of Bristol, during renovation work on the roof. Unlike Templecombe, the name Cameley doesn’t instantly suggest a Templar holding -- but it’s adjacent to another village called Temple Cloud which does. Both Cameley and Temple Cloud came into the hands of the Templars early in the thirteenth century. Strangely (and conspiracy theorists can make what they want of this) the Cameley head is not on display to the public, and has never been made available for scientific analysis. Visually, it has striking similarities to the Templecombe head -- the wide, staring eyes, the forked beard, and the lack of a halo which you would expect if the image was meant to represent Jesus Christ. 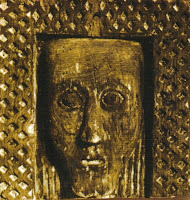 Another view of the Cameley head, which shows the unorthodox iconography even more clearly, is shown below. Personally, I can't see why the Cameley Head couldn’t have been an “idol” worshipped by the Templars. The style and workmanship look mediaeval. It’s not as if the Head had to represent something really outlandish, like a demon or a pagan god. In the Middle Ages, the notion of “idolatry” would have encompassed the veneration of any unauthorized representation of a Christian saint, or even of Christ himself. Why academics find it so intolerable that the Templars could have worshipped such an image is beyond me. Considering the wall painting in the same church of fish and a crab, this might be a depiction of Al-Khidr - The Green man carried over the River of Life by a fish. He would have had a white beard when the paint was still on and the woodwork would have been green. Al-Khidr, or Al-Khadir is also called 'The Green Man' and is an Ascended Master of Gnostic teaching. In the West this symbol of pure knowledge and complete understanding was called Hermes Trismegistus / Mercurius and although the Catholic Church has managed to remove Hermes from its bibles, in Islam they still preach the lineage of knowledge as Al-Khidr (Hermes/Hormux) teaching Moses and his teachings also instructing Jesus and Muhammad. The visit to Moses is represented as the Burning Bush - which is a depiction similar to ancient paintings of Khidr in tree, under a tree with his head on spiritual fire; which turned into a Halo in Western religious art. The Templars were schooled in ancient mysticism and occultism and they will have invoked Al-Khidr plenty in their services, when not invoking the Goddess of the Sacred Feminine - the Vatican's biggest fear. Don't forget how much and how often the Bible has been changed for political and social control. Forget about Basphomet and Illuminati rubbish - that's Vatican fear mongering - look beyond the veil of reality and get in touch with your true vibrational nature and spiritual power. The Templars possessed the knowledge of the vibrational reality of the Universe and the means to work with it. No wonder it's forbidden knowledge in the eyes of the current priests and scholars! If you fear Sufi teachings, you fear the true history and ultimately the real message of Christianity, Jewish faith, Islam and Hinduism.